Last week was spring break and every day was an adventure. Not every adventure was in Boston, because I was home, but many of them were still nearby. Kicking off the week, I spent Sunday drilling with a reenactment group based out of Dunstable. These were Revolutionary war reenactors, so many men of my age and ethnicity would be soldiers – I drilled while armed with a firelock :). Some of you may know this group as the End Zone Militia for the Patriots. I forgot to ask if I could post pictures, but I will probably get some later. After drilling with the men for a couple hours, I joined the ladies downstairs. I learned to sew a backstitch and worked on one seam of a gown. There are some nice needle-shaped holes in my fingers now, but the half-seam I finished in an hour looks fabulous. Tuesday, I gave blood and was basically too tuckered out to do anything else. I talked with a really cool medical assistant who appreciated that WIT students still organize blood drives, despite controversy with the FDA. Wednesday, a couple of my Wentworth friends came over and we hiked around south Massachusetts and northeast Rhode Island. We hit seven geocaches in one day without paying a cent for a geocaching membership! 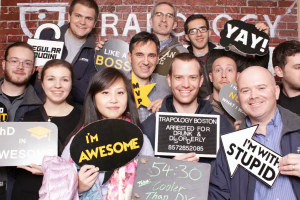 Thursday I had a throwback day to fall semester and did another “escape the room” puzzle. 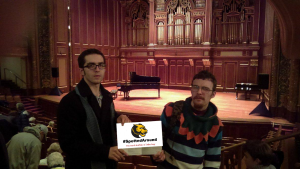 This time I went with my girlfriend instead of a team of engineers and in Providence instead of Boston (we had coupons). We meant to go earlier in the year, and got snowed out, but the manager decided to let us go for free over break! The experience was different, but the result was ultimately the same, of course. We completed Escape Rhode Island’s ExMachina puzzle, which, at the time, had a 13% winrate *dusts off fingernails*. Notice anything in common with these things I did over break? I’m a college student on a budget; none of them cost money. Admittedly, the escape game was a gift from nice the manager, so something like that takes a little luck and begging. With a couple friends and a little creativity, you will never run out of things to do around here. A hackathon is a friendly competition for students to network with other students – and sponsor representatives 🙂 – while making hardware or software tools and games. We provide free food, space, power, internet, other hackers, some hardware, some APIs, workshops, and prizes. Free. Last week, the head of the group that is organizing Wentworth’s Hackathon announced that we have entered CRUNCH TIME. 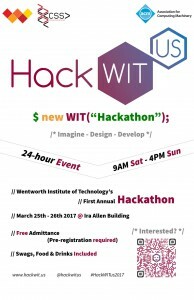 HackWITUs 2017 will be Wentworth’s first annual Hackathon. The planning committee has been preparing since fall semester for this event that lands on March 25-26. One of our members even made a blog just about us! We have our own website designed to spread information and show off our development skillz (even though it’s a static webpage, it’s cool enough that it feels interactive). Behold our fancy logo and website! We’ve been reaching out to sponsors all over the place to gather the resources to put this on for the people that come to the event. So far, we’re getting stuff/help from various departments and people around the school, Microsoft, Facebook, edX, kwidil, goPuff, and a few others. I always bring my resume to hackathons for a shot at jobs with sponsors; some companies sponsor hackathons and send a representative as a way of scouting talent. If you can’t come this year, this will be an annual event. So hopefully I can meet you next year :D.